I hate when I can't find them anywhere in NY. So I made TapRm, to deliver the best craft beer right from micro-brewery taprooms that are otherwise nearly impossible to find in NY. Exploding Airplane Beers and Big Distributors. For my birthday, some of my hometown friends from Florida were coming up to New York to surprise me. Knowing how much I love beer, they tried to send me their favorite Florida craft brews ahead of time. Frustratingly, they found out that all of their favorite FL beers were not in NY. Anywhere. They had to resort to checking a duffel bag of more than 60 beers on an airplane. Of course, when they arrived at LaGuardia, nearly half of them exploded over the entire luggage cabin! For the record though, the other half were delicious. After asking the FL brewers why we couldn't find their beers in NY, we learned that the problem was distribution. 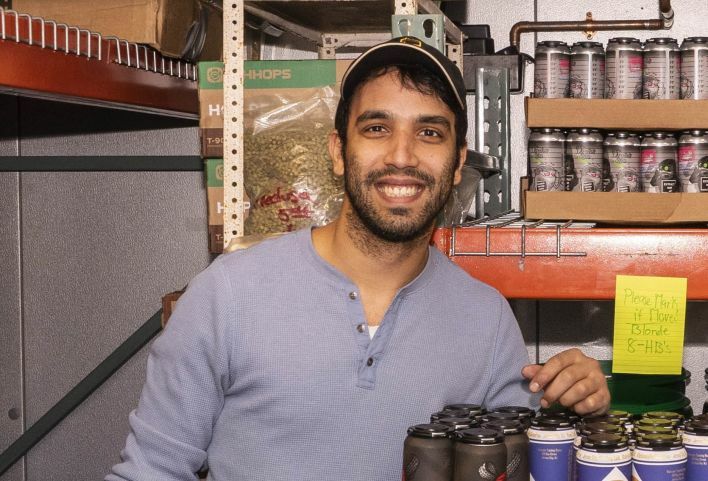 Due to some very old laws, a small brewer can't sell in NY without a NY distributor. And there's more... the laws then require the distributor to sell to a bottleshop before beer lovers like you and I can buy the beer. That is the only way we can get those beers other than going to the brewery's taproom in FL! As you can imagine, that's difficult to manage for a small busy brewer and very expensive. Even worse, the only real distributors out there also distribute big beer brands like Budweiser and Heineken, so why would they ever help out the little guy? They've got "bigger" things to sell. So while a lot people can sell their products online (like your neighbor who made a fortune shipping dog wax pulled from her poodles in her garage to dog fanatics around the world), brewers who make amazing beers could only sell to distributors, until TapRm! I'm a lawyer (hold your jokes) and at the time worked in e-commerce for a "big beer" company (Budweiser, hold those jokes too) who was ALSO having these same issues with trying to sell online and expand brands quickly across the United States. Even the biggest beer brands had to sign up a patchwork of hundreds of distributors to be able to sell a new product nationwide. So you can imagine the smaller craft brands barely stood a chance. Given my experience, I thought I may be in a good position to fix all these problems for craft brewers and craft beer lovers everywhere. So I started TapRm. I now seek out the best beers from the best brewery taprooms around the country (sometimes the world) and pop them up online for delivery in NY in 2-3 Days. No more duffel bags on airplanes. No scary distributors, no cost at all to the brewers. Best of all, you get the freshest beer and the lowest prices—everybody wins! So let me know your favorite brewery that you can't find in NY and we'll give them a call to make sure you can get some soon. As you can tell, we're pretty lean and really small. In fact, everything you see and experience online is physically done by a handful of hardworking, talented people – not messenger bots. Being small means we care, and you will always get a personal response from a real human anytime you have a question. We are giving life to this tech-struck industry. Our craft beer marketplace gives local craft brewers and customers like you the opportunity to connect. As I mentioned, beers that you buy on other online marketplaces only give about 20% to the brewers because of all the middlemen. Not on TapRm. Way more of your hard-earned dollars go directly to the family owned businesses that make your beer, just as if you were going to your neighborhood brewer but with the convenience of ordering online. No more illegal shipping around the country or exploding beers on airplanes--you're welcome, Delta. Brewers make more to support their passion and consumers get access to their favorite beers.